By 6 A.M. CJ McCarty, Curator of Birds from the Oregon Aquarium in Newport, Oregon and I were on our way to the airport. 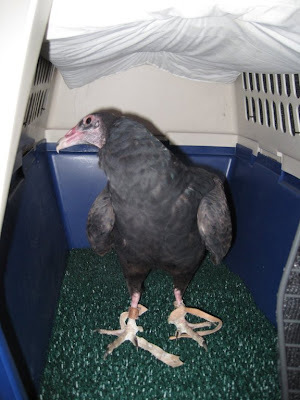 By that time we had already caught up the Turkey Vultures, installed them in their airline kennels and got them into the suburban for the hour plus trip to the airport and of course had to scrape ice off the windshield. :( Oh how I love October in Wisconsin. CJ called me earlier this evening to let me know they are arrived at the Portland Oregon airport and were beginning the three hour drive to the facility. She promised photos soon of the vultures in their new digs. I will write about the entire adventure when I get those photos. We are happy when some of our birds that are not releasable to the wild find great homes in educational facilities such as the Oregon Aquarium. They will educate thousands of folks on a daily basis about how amazing vultures are and that is one of the missions here at REGI. 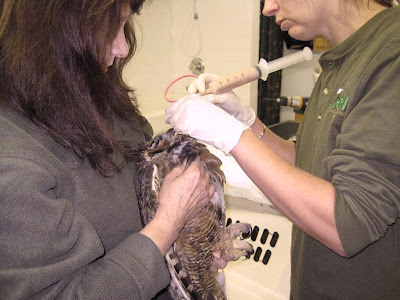 The Great-horned owls admitted on Tuesday are doing much better. While still on heat and being tube fed, they have improved to the point where they will likely begin eating some on their own tomorrow. It is great when we can see improvement in birds that arrived in such critical condition. 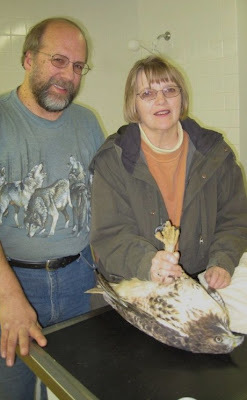 A few hours ago long time REGI volunteers John and Vicki Kuester brought in a Red-tailed Hawk with a broken wing from Rib Lake, WI. It turns out the capture of this beautiful adult male hawk was quite a story and they have promised to share it with me this weekend. I will update everyone then. When we called John and Vicki, we understood the bird was located near their home. In the end it was about 50 miles away from their location. We appreciate our volunteers so much and John and Vicki have so much on their plate as it is. They do animal rescue for llamas, rabbits and other animals. As they say if you want something done ask a busy person, and John and Vicki have come through for us so many times. It has been a long week so I am off to bed. I can count on tomorrow being a busy one as well.